The performance of Cyprus on a range of indicators selected to monitor progress in VET and lifelong learning across the European Union (EU) is summarised below. The chart compares the situation in Cyprus with that of the EU, based on the most recent data available (this differs by indicator). Data in the chart are presented as an index where the EU average equals 100. If the index for a selected indicator for Cyprus is 100, then its performance equals the EU average. If the index is 90, its performance is 90% of (or 10% below) the EU average. If the index is 200, the performance of Cyprus is twice (or 200%) the EU average. For some indicators, such as early leavers from education and training, a country is performing better if its score is below that of the EU average. Participation in IVET in Cyprus is relatively low compared with the EU average. In 2015, the percentage of upper secondary students enrolled in IVET programmes (at 15.6%) is significantly lower than the EU average (47.3%). For female students the difference is even greater (6.9% in Cyprus; 42.0% for the EU). The share of students in upper secondary IVET enrolled in programmes providing direct access to tertiary education (97.9%) is well above the EU average (66.7%), but the percentage of young VET graduates actually participating in further education and training is lower (23.6% in Cyprus and 32.8% for the EU in 2016). In 2016, the percentage of adults participating in lifelong learning in Cyprus is 6.9%, lower than the EU average of 10.8% and the target of 15% for the EU as a whole. Older adults as well as the unemployed are less likely to engage in lifelong learning compared to the EU average. 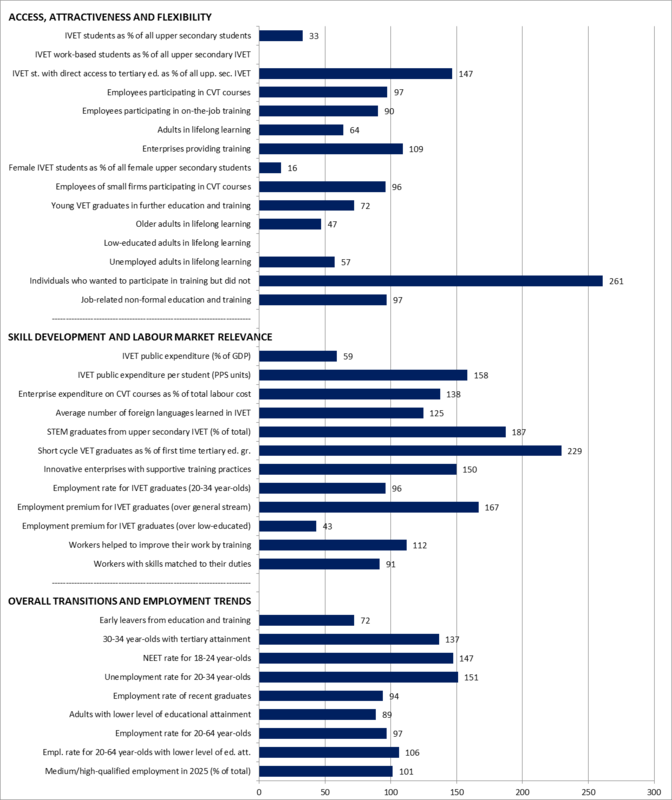 Data from the 2010 CVTS suggest that the share of enterprises providing training in Cyprus is higher than the EU average (72% Cyprus, 66% the EU) while employee participation in training (CVTS courses and on the job training) is slightly below, but almost on par with, the corresponding EU averages. The proportion of individuals who wanted to train but did not is higher in Cyprus at 24.8% compared with 9.5% in the EU (data for 2011). 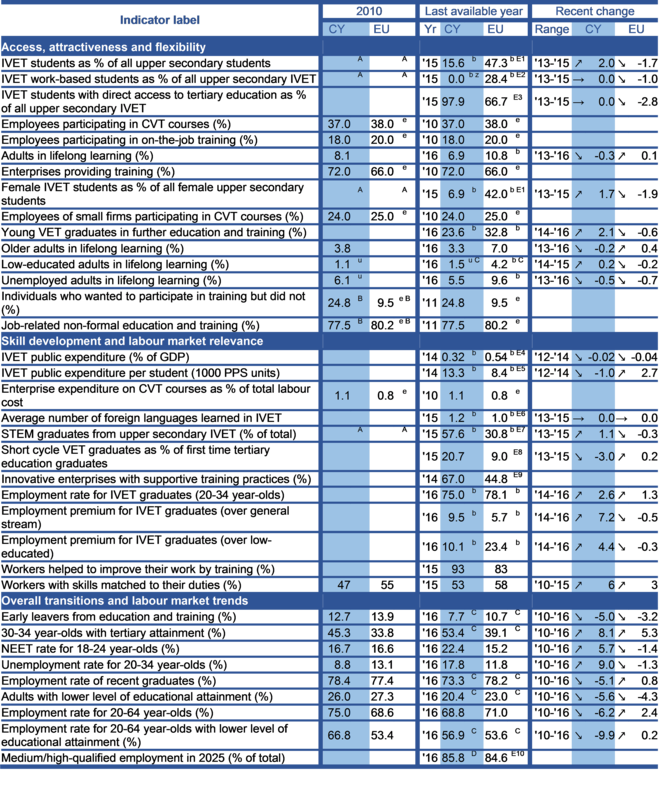 Figures for Cyprus are high for several indicators in this group. Public expenditure on IVET as a percentage of GDP in 2014 (0.32%) is below the EU average (0.54%) but expenditure per student is higher (13 300 PPS units in Cyprus and 8 400 PPS units in the EU). The percentage of innovative enterprises providing supportive training (67.0%) is higher than the EU average (44.8%) (based on 2014 data). The same is true of the proportion of STEM graduates from upper secondary IVET (57.6% compared with 30.8% for the EU as a whole in 2015). The employment rate for IVET graduates (aged 20-34) at ISCED levels 3-4 (75.0%) is slightly below the EU average (78.1%). IVET graduates in Cyprus enjoy a positive premium on their employment rate compared to graduates from general education at the same ISCED level, as well as to graduates at lower ISCED level. Their employment rate is 9.5 percentage points higher than for graduates from general education (well above above the EU average premium of 5.7). The employment rate for IVET graduates is also 10.1 percentage points higher than for graduates with lower-level qualifications (though this is below the EU average premium of 23.4). These employment figures relate to 2016 and exclude young people in further education and training. The unemployment rate for 20 to 34 year-olds in Cyprus is much higher than the EU average (17.8% versus 11.8%), and the employment rate for recent graduates is lower (73.3% versus 78.2%). The unemployment rate for 20 to 34 year-olds in Cyprus in 2016 is 9.0 percentage points higher than in 2010, in contrast with the EU as a whole where the rate has dropped (by 1.3 percentage points) over the same period. The same pattern is observed in the data about the NEET rate for 18 to 24 year-olds. Correspondingly, the employment rate of recent graduates in Cyprus has decreased by 5.1 percentage points between 2010 and 2016, whereas this employment rate in the EU as a whole has increased slightly (by 0.8 percentage points). The share of early leavers from education and training in Cyprus has decreased by 5.0 percentage points between 2010 and 2016. At 7.7% this share is lower than the Europe 2020 and national targets (both set at 10%). The share of 30 to 34 year-olds with tertiary-level education already exceeds the Europe 2020 average target (40%); at 53.4%, this share has also surpassed the national target (46%). The employment rate for 20 to 64 year-olds has fallen between 2010 and 2016 by 6.2 percentage points. This change is even more pronounced for 20 to 64 year-olds with a lower level of educational attainment, with a reduction by 9.9 percentage points over the same period.